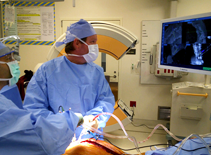 Dr Johnson and Dr Sam Ghostine using computerized image guided surgery (IGS) technology to perform complex thoracolumbar spinal deformity correction procedure recently at UC-Irvine Medical Center. This technology has been a through along process of development since the early 1990’s now used on a regular basis in the operating room for complex spinal surgery. 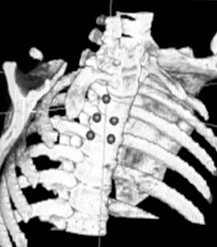 Computer guided spinal surgery uses application of stereotactic navigation methods that were developed in the 1960”s for brain surgery that used bulky frame devices and were not easily applied to spine surgery. 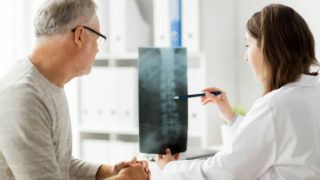 Dr Johnson has been involved in the development of applying this technology with high speed computers and intraoperative navigation procedures that increase the accuracy, reduce complications, reduce radiation and shorten operative procedures to ultimately improve patient outcomes. Holly LT, Bloch O, Obasi C, Johnson, JP: Anterior image guided spinal registration: a comparative accuracy study. Journal of Neurosurgery: Spine 95:196-201, October 2001. Bloch O, Holly LT, Johnson, JP: Accuracy of image guided placement of C1-2 transarticular screws. Journal of Neurosurgery: Spine 95:74-79, July 2001.